Not all of the Monsters of Greek Myth were monstrous, although many were. In many of the stories from Greek mythology creatures half animal and half man, or man -like but possessed of animal qualities, are prevalent, and not all of them are monsters. In most cases the various races of Greek Myth are similar to the gods and goddesses of Olympus, personifications of some aspect of life familiar to the Greek. The wind gods were known as the Anemoi, sometimes depicted as horses, sometimes as men with wings, others just as winds themselves. There were Boreas, the north wind, Notus, the south wind, Zephyrus,the west wind and Eurus, the east wind. The Greek myths were the origin of these half horse, half man creatures, which became very popular in medieval culture and in modern fantasy literature. Today considered wise scholars, many legends have them as lusty, troublesome tribes. Not a specific race, the Chthonic were in general "Earth gods", or simply a personification of earthy desires, such as lust. Often Cyclops is thought to refer to a specific entity out of Greek myth, but the figure in question, Polyphemus, was a member of the Cyclops race - so he was a Cyclops, not the Cyclops. These creatures were the sons of Poseidon, giants with one great eye, and shepherds by nature. The Dragons of Greek mythology were more great serpents than the western Dragons of the middle ages; but they were prevalent monsters nonetheless. Known as the Furies in Roman counterpart, the Erinyes were the personification of the anger of the dead - nothing to fool about with. While cast as the villain role in many stories, the Erinyes were more figures of justice than evil, haunting those who did dastardly deeds. Today these figures would simply be called Giants, and they were sort of like second rate Titans. Not immortal as the Titans were, nor as powerful as the gods and goddesses of Olympus, they nevertheless tried to take over and made war on Zeus and his family. They failed in their attempt. 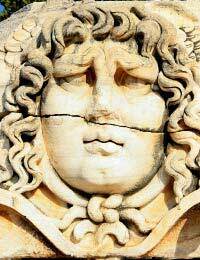 The most famous Gorgon was Medusa; because of this people might say "a Medusa" when they mean "a Gorgon." The classic Medusa was a woman with a head full of snakes for hair, whose gaze could turn a body into stone. The Nymphs were female spirits linked in some fashion to the land, or the water. Nymphs were also where the Muses came from, nine spirits who specifically were linked to artistic endeavours and were said to inspire artists, writers, and musicians. The weavers of the thread of destiny, the Moirae, sometimes called the Fates, were those who had control over the destiny of everything - gods as well as men. Even Zeus feared them and was under their power. The Greeks had horse-men, and bird-women. These creatures had the bodies of birds and the upper bodies and heads of women. They were the personification of the spirit of death. While man creatures of Greek myth seemed to fill a role or have an agenda, the Harpies seemed to be used as dangerous creatures to be encountered, much as a bear or a lion, but more fearful.